Both organizations met in Barcelona on December 2, 2017, with a complete agenda of the whole day to discuss areas of common interest. Almost all subjects were addressed, although with different intensity. Special attention was focused on topics that involve CEPT, where both are observers, agreeing some actions for the coming months. In the picture: YO9RIJ, G3BJ, EI3IO and EA3CIW at the meeting facilities FEDI-EA provided. Of course this is just the beginning and there is a lot of work to be done in favor of amateur radio and, above all, of the radio amateurs. But the good atmosphere of the meeting predicts positive results for the future, even if they do not occur in the short term. 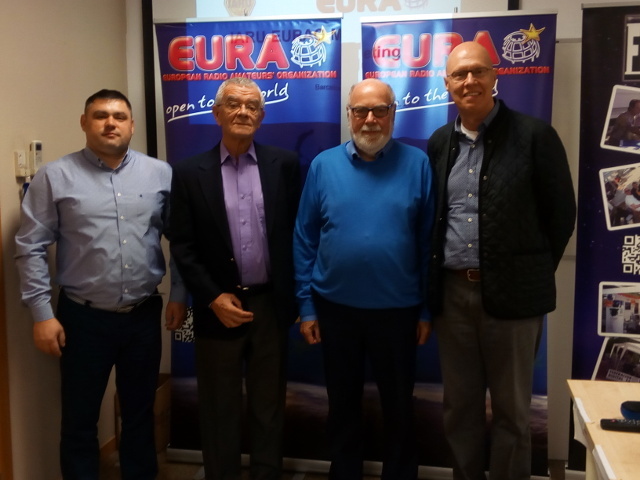 At the end of the meeting between IARU Region 1 and EURAO both agree this shallow joint statement.